On July 20th, Japan’s Ocean Day, known as “Umi No HI”, the Cuban flag was raised in Washington D.C. as the Stars & Stripes was raised in Havana. For the first time since 1961 when diplomatic ties were severed between the two countries were these flags flown in each others’ capitals. Pope Francis assisted in breaking the ice. 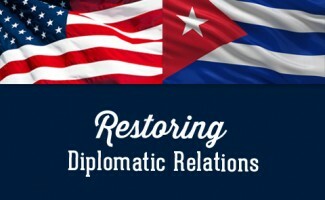 Many are happy, yet many are worried that this new diplomatic initiative will only strengthen the present Cuban regime without implementing the any reforms for restoring democracy to this island nation. Cuba’s foreign minister railed against the United States’ travel restrictions, trade embargo and presence at the military base at Guantánamo Bay. Cuban official Bruno Rodríguez said those policies must end before the two countries could bring their grudge to a close, and lend “some meaning to the historic event that we are witnessing.” Rodríguez invoked the “nefarious consequences” of the Platt Amendment of 1903, a series of conditions written into the Cuban Constitution that gave the United States sway over Cuban affairs and the right to establish military bases in Cuba. Living in Okinawa, its time to “make a wish” for sanity, with family in Cuba and Miami, one cannot help but compare the situation here, the stalemate concerning the Futenma MCAS relocation to Oura Bay in Henoko, and the recent commentary by leading politicians in the USA, who demand that the democratic principals and human rights of the Cuban people be not only restored but guaranteed. People in Japan are demonstrating as Prime Minister Abe’s popularity has plummeted while leaders in the US applaud his bulldozing of democracy, “for the people, by the people” as Prime Minister Abe mentioned in his address to the joint houses of congress earlier this year. Japan is still suffering from the consequences of the San Francisco Treaty of 1952. Has Japan been artificially suppressed by the victorious allies? Has this dependency created the un-natural sub-subservient vassal state relationship? Are these the “nefarious consequences” of the US-Japan Security Treaty? The genie is out of the bottle both in Havana and Tokyo. Yet, discussion and dialogue are key elements to diplomacy. Havana and Henoko have more in common than meets the eye. When the dust settles, we can hope for a stronger and healthier US-Japan Alliance and friendly ties with Cuba, only 90 miles from the US. It is time that democracy be restored in Cuba and allow for transparency, reconciliation leading towards a sustainable 22nd century. As Pope Francis, quoted the Earth Charter Initiative, I would pray that from the Ryukyu Islands to the Canary Islands and islands in between, take a moment to endorse the Earth Charter as a first steps to forge a future for the next generations, renouncing war on this very, very fragile blue planet of ours. Next week: THE OCEAN BROTHERS and Ginoza HS students Ocean Challenge. For comments and suggestions on this article, please contact edo@okinawaocean.org.